"Stand-out battery-operated wand. Use the wand to continuously spray along baseboards, the edge of mattresses, and along the top of curtains." "Highly effective formula is designed to eradicate even the most stubborn of bed bugs...offers residual protection for up to 16 weeks." "Silica essentially acts like a sponge to absorb water from the bugs...keep it dry, and it can keep working for up to 10 years." "An organic, non-toxic formula and is also non-staining; but only kills on contact and doesn’t have residual effects." "Travel-sized bed bug spray comes in a convenient 2-ounce bottle...creates a barrier that will keep you from picking up bed bugs when you travel." "Water-based spray is safe for most surfaces, including your mattress if you don’t want it to become stained by pesticides." "Glue boards can be folded flat, then taped around the legs of bed frames or other furniture..to stop the bugs from reaching their destination." 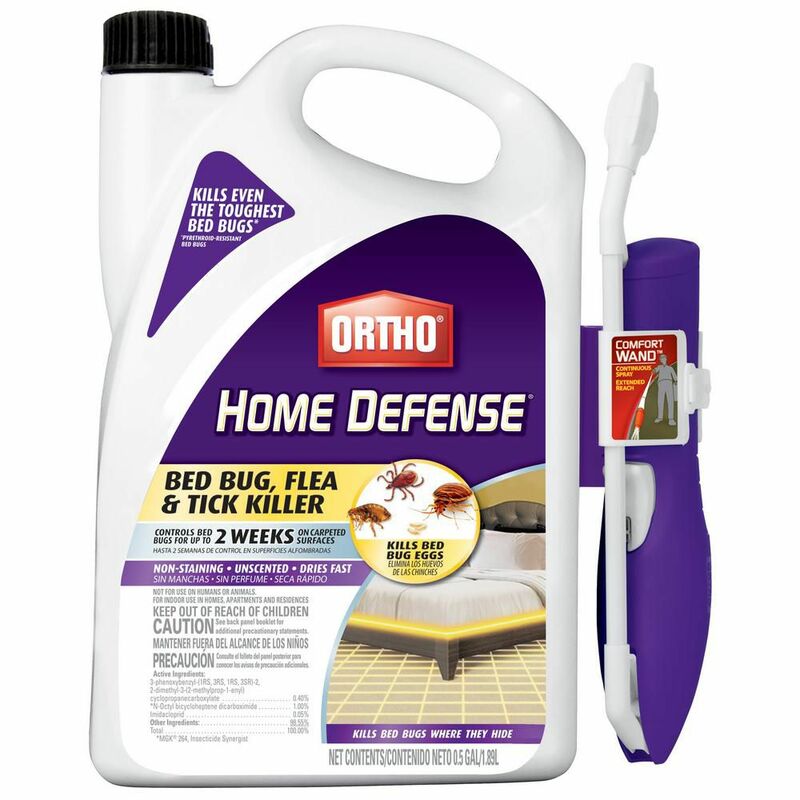 If you’re looking for a versatile way to attack your bed bug infestation, Ortho Home Defense Bed Bug Killer is a top choice. The 1.5 gallons of quick-acting solution will kill bed bugs on contact. It also kills the eggs, making it great for spraying onto the nest or into crevices and cracks where the bugs may be lurking. What really makes the Ortho Home Defense Bed Bug Killer stand out is its battery-operated wand. Use the wand to continuously spray along baseboards, the edge of mattresses, and along the top of curtains. Since the formula is non-staining, you can spray without worry. Instead of using a pump spray or aerosol can, the wand ensures even, consistent product application. People also appreciate the fact that Ortho Home Defense Bed Bug Killer is odorless and is formulated for even pyrethroid-resistant bed bugs. Best Spray Bottle: Harris Pyrethroid Resistant Bed Bug Killer, 32 oz. If you want a handy, ready-to-go bottle of bed bug spray at your side, Harris’ Pyrethroid Resistant Bed Bug Killer is a great option. This highly effective formula is designed to eradicate even the most stubborn of bed bugs that have become resistant to pesticides containing pyrethroids. What sets this bed bug spray apart is the fact that it offers residual protection to kill remaining bugs for up to 16 weeks. While Harris Pyrethroid Resistant Bed Bug Killer is available by the gallon, order the convenient 32-ounce spray bottle to keep handy and spritz bed begs at first sight. As with most bed bug products, this spray is most effective when used in conjunction with thorough cleaning and multiple treatment options. Be quick on the trigger in the event of a bug sighting with this bed bug spray bottle containing Harris Pyrethroid Resistant Bed Bug Killer. For a bed bug powder that is long-lasting and effective, skip diatomaceous earth and head straight for CimeXa Insecticide Dust. CimeXa is a bed bug powder made from a manufactured silica powder, unlike diatomaceous earth which is a naturally-occurring substance. Both products work to dry out the exoskeleton of bed bugs, which eventually kills them. However, the silica in CimeXa essentially acts like a sponge to absorb water from the bugs, whereas diatomaceous earth scratches the cuticle protecting the exoskeleton - making it hard to retain water. The important thing is that CimeXa has been found by many people to be vastly more effective as a bed bug powder. For long-term control, it’s hard to beat CimeXa’s staying power—simply apply the powder, keep it dry, and it can keep working for up to 10 years. A suggested usage is to take a paintbrush and apply a thin layer along baseboards or in cracks and crevices where bed bug activity has been noticed. You’ll only need a little since the fine particles of silicon dust will attach to passing bed bugs using electrostatic charge. Even though this product is considered to be non-toxic for humans, be careful in applying CimeXa to avoid inhaling the dust and keep it out of the reach of children. If you’re concerned about harsh chemicals and are looking for a natural bed bug spray, try Eco Defense Bed Bug Killer. This bed bug spray has an organic, non-toxic formula and is also non-staining. Many people with small children or pets appreciate using Eco Defense Bed Bug Killer thanks to the fact that it doesn’t have any harsh chemicals. The formula does have a noticeable scent due to plant oils, but most users didn’t find it to be too offensive—especially since its all-natural. While the Eco Defense Bed Bug Killer is an effective, natural bed bug spray, it only kills on contact and doesn’t have residual effects. So for serious infestations, best results are seen when this product is used along with other treatment methods. Relieve vacation worries by getting a bed bug spray for travel. The Rest Easy Bed Bug Spray is a perfect way to ward off an infestation when you’re on the road. This travel-sized bed bug spray comes in a convenient 2-ounce bottle that will easily pass TSA-safety requirements and won’t take up a lot of space in your luggage. It has a nice cinnamon scent that users like, in contrast to some of the harsher smelling travel bed bug sprays available. Use the Rest Easy Bed Bug Spray to treat mattresses and furniture when you’re traveling. While it isn’t designed to treat a home infestation, it can create a barrier that will keep you from picking up bed bugs when you travel. It is a great idea to use this bed bug spray for luggage also. If bed bugs have invaded your space, you need to treat your mattress with a bed bug spray. While there are a lot of suitable bed bug sprays for mattresses, Bedlam Plus is a popular option. This water-based spray is safe for most surfaces, including your mattress if you don’t want it to become stained by pesticides. The Bedlam Plus spray will kill bed bugs on contact, but also has up to 2 weeks of residual killing power. A common question might be whether or not you can spray the entire surface of your bed with this bed bug spray for mattresses. The answer is that you can, but you don’t necessarily need to. Since bed bugs prefer to hide rather than be exposed in the open, they’re most likely to be live and breed in enclosed spaces and crevices. For that reason, it’s recommended to spray Bedlam Plus along any tufts, seams, and folds of your mattress. For a budget bed bug solution, try glue boards. While it isn’t a bed bug spray and may not be the fastest way to eradicate the problem, Trapper Max Glue Boards can prevent bites and provide peace of mind. These glue boards can be folded flat, then taped around the legs of bed frames or other furniture. Since bed bugs crawl up to the top of the bed, a tightly secured glue board will stop the bugs from reaching their destination. 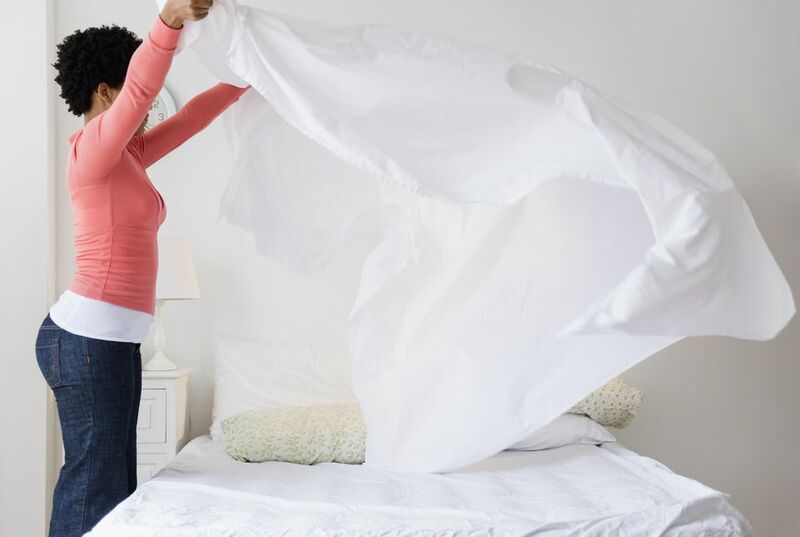 You’ll need to still eradicate any bed bugs and eggs from your mattress or furniture, and it’s also suggested to move furniture away from the walls to prevent bed bugs from accessing your bed by another route. But for a few dollars, the Trapper Max Glue Boards are super sticky and will collect any bed bugs that are trying to make their way to your mattress.